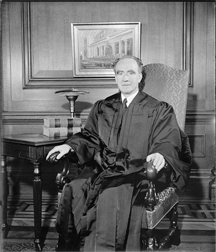 Associate Justice of the U.S. Supreme Court Frank Murphy (1890-1949), who served from 1940 to 1949. He had a rich political career, serving, among other capacities, as Mayor of Detroit, Governor of Michigan, and U.S. Attorney General. As a Justice, his most famous case was Korematsu v. United States , which upheld the constitutionality of the World War II internment of Japanese-Americans, and from which he passionately dissented. In his dissent, he criticized the majority opinion as "legalization of racism." Although Korematsu's conviction was overturned by a lower court in 1983, the Korematsu decision stands to this day. Whether or not the government could prevail against a citizen in similar circumstances today is controversial. Photo from the collection of the U.S. Library of Congress Prints and Photographs Division, courtesy upload.wikimedia.org/wikipedia/commons/thumb/d/da/JusticeFrankMurphy.jpg/657px-JusticeFrankMurphy.jpg. You have a great idea — a vision of something new your organization can do that will transform it, if not the world. You've mentioned it to some people who might be able to help make it happen, but they haven't done much. Maybe nobody else gets it, or has the passion for it, or whatever it takes. You're about to encounter the passion-professionalism paradox. In the modern workplace, to be passionate is to persist in pursuit of objectives, despite obstacles that would deter most of one's colleagues. Most people believe that only strong emotion can provide the drive that enables the passionate to make the sacrifices and take the risks that make persistence possible. We associate passion with excitement, commitment, and enthusiasm, possibly beyond the point of sound, objective judgment. To be professional in the modern workplace is to conduct oneself in accordance with the standards, ethics, politeness, and demeanor of one's position. Most people regard professionalism as the right combination of skill, judgment, stability, objectivity, composure, precision, and focus. Professionalism, many believe, requires discipline of the emotions, to prevent them from clouding judgment and biasing decisions. Professionalism is dispassionate. To lead the people of your organization to somewhere new, or to persuade them to adopt a new way of seeing some small part of the world, requires passion. Yet, those same people must trust the vision you offer. They must feel that you're objective about that vision, that your judgment is sound, that you are knowledgeable, and that the vision you advocate is achievable. Only by projecting professionalism can you influence others to adopt your vision. Only by being passionate can you marshal the internal resources needed to overcome the obstacles to realizing that vision. Passion and professionalism are in tension. Visionaries who project more passion than professionalism stir doubts about their objectivity and their motives. Visionaries who possess more professionalism than passion have difficulty maintaining the level of commitment needed to deal with the challenges that obstruct adoption of their visions. To resolve the tension between passion and professionalism, use both. Professionalism requires continuously calm, objective assessment of your situation, solving problems as they arise, or skirting them if possible, or deferring them until you can solve them. Professionalism requires resilience, making adjustments when necessary. Having a passion for professionalism makes this possible even when no path forward is in view. objectivity and their motivesis the drive that makes persistence possible, despite obstacles that would deter the less passionate. Nurture your passion. Do what's necessary to renew the energy as you consume it. Being open to seeing more clearly what thrills you about your vision is good. Better is being disciplined about seeking those thrills. Would you like to see your comments posted here? rbrenPbLCVQlWZFpthJinner@ChacYljbknPaeUDhrvJhoCanyon.comSend me your comments by email, or by Web form. I offer email and telephone coaching at both corporate and individual rates. Contact Rick for details at rbrenHHIORXrrjpWCviwsner@ChacdgIpUkitQJARJeOnoCanyon.com or (650) 787-6475, or toll-free in the continental US at (866) 378-5470.